Even though metals can be found virtually everywhere in the earth's crust, it is in many cases not economical to extract them. Especially before the establishment of mining operations, a large number of samples need to be analyzed. We provide accurate, safe and robust metal titration instruments, with options to fully automate your analysis processes. Metals are abundant in the earth and can be found in minerals and ores everywhere. Although we find metals everywhere in the earth’s crust, it is not always economical to extract the metal from the minerals. Before one can determine if a site or mass of minerals or ores is worth establishing mining operations, geological surveys must analyze a large number of samples from the site. 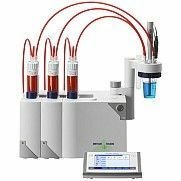 Using a METTLER TOLEDO Excellence Line titrator, such as the T70, metal leaching and concentration analysis via titration is made safe and easy. Using an array of automated pumps and dosing drives, hazardous chemicals additions, like concentrated nitric acid can be automated to limit operator interaction. Sample analysis can be made even more efficient with one of our many auto-samples high throughput survey sample and leaching bath analysis. The easy to use and user tailored touchpad TFT display makes operation as easy as One Click®. Integrating LabX® titration software makes data capture and organization of results and sample identification easy and secure. With a large database of standard titration methods for metal analysis, METTLER TOLEDO’s robust techniques, safe chemical handling, automation and integrated sample and result management, provide the perfect solution for your mining operation.